An atomic submarine can be a pathway to an atomic bomb. The Highly Enriched Uranium [HEU] needed for a bomb can also fuel a submarine. Higher levels of enrichment provide longer reactor core life and less frequent refueling. A naval reactor core might contain from 200 to 400 kilograms (kg) of U-235. The minimum mass of fissile material needed for a nuclear weapon is called a critical mass and depends on many factors. A bomb made with Urannium might need from 15 kig to 56 kg of U-235. The HEU required for a single nuclear submarine reactor would thus be the equivalent of at least 3 and possibly upwards of nearly 30 nuclear weapons. The Navy of Brazil will receive the first nuclear submarine of its own construction not earlier than 2029. This was stated by Commander of the Navy of the Republic Admiral Eduardo Bacellar Lil Ferreira, according to the local edition of Poder Naval in June 2018. Initially, the first Brazilian nuclear submarine was expected to receive in 2023. Accordingly, the timing of the preparation of some of the coastal infrastructure facilities for basing future Brazilian nuclear submarines has shifted to the right. Docks for them are planned to be completed after 2021. Earlier in February 2018, Ferreira reported on the start of the development of the technical project of the nuclear submarine. Brazil and France have also signed an agreement to develop a French/Brazilian nuclear powered submarine. In line with the deal, as of 2011 Brazil's first nuclear submarine was scheduled to enter service in 2023. 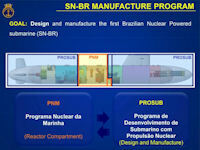 In Brazil, the SN-BR is the declared ultimate aim of the Prosub program launched in 2009. The project was first conceived in the 1980s. Following SN-BR feasibility studies begun in 2012, the Brazilians worked on the preliminary design to January 2017. At that time, the detailed design study was scheduled to begin in July 2018. The design team, then comprising some 200 people, was expected to grow to three times this current head count. The Brazilian Navy hoped to lay the keel for the SN-BR boat in early 2020, to launch it in late 2027 and to deliver it by around 2030. The navy's most ambitious program is the development of a nuclear-powered submarine. It should be understood, however, that the high level of enrichment of the uranium used in some naval nuclear propulsion reactors is nearly that required for a nuclear weapon. Currently, the US and UK naval reactors are fueled with weapon-grade Highly Enriched Uranium [HEU] with more than 93 percent uranium-235 (U-235), Russia uses HEU containing more than 20 percent U-235, while France, having used HEU has decided to shift to low-enriched uranium (LEU) containing less than 20 percent U-235. The nuclear submarine program enjoys broad political support, including from the political left, in part because of the perceived technological benefits that may be derived from the project. The 2010 Joint Plan and Marine Equipment of Brazil (O Plano de Articulação e Equipamento da Marinha do Brasil - PAEMB) provided for 15 conventional submarines (SBR - Brazilian Submarine), 6 nuclear submarines (SNBR - Brazilian Nuclear submarine). In November 2009, the Minister Jobim announced that Brazilian plans were to build 3 SNBRs instead of the original single. In 2010, it was said that eventually 15 SBRs and 6 SNBRs were to be built in the country. In December 2008 an agreement was signed between the governments of Brazil and France aimed at preparing the Submarine Development Program for the Navy of Brazil. Through this agreement, is set to build four new conventionally powered submarines, derived from the model "Scorpene" the SBR, plus one nuclear-powered submarine, the SNBR. The agreement provides for the construction of the first Brazilian nuclear-powered submarine, designated as SNBR. DCNS will assist the MB in the design and construction of "non-nuclear parts" of the first unit, which will come into operation in the years 2025 and 2030. The SNAC-2 program has been under way since 1979, but progress has been slowed by persistant funding problems. Concerning the plans to produce nuclear submarines in Brazil, Naval Minister Maximiano da Fonseca said in March 1984 that there is no clearly defined program for that purpose. The program under study pertains to the manufacture of steam-powered submarines "which may develop in that direction in the future." However, there is a contract, still contingent upon financing, for the building of a first conventional submarine in Germany, with the assistance of Brazilian naval technicians. On the basis of the knowledge gained, a second unit will be produced in Brazil. From the first, in 1979, until around the early 1990s, the Navy Nuclear Program relied on the contribution of additional resources to the budget of the force, from other government sources, that allowed the fuel cycle, achieved in the late 1980. From there, the program was funded, virtually, with only budget resources of the Navy of Brazil (MB), which, in addition to declining, must meet all other requirements of the force. The solution shown to completion of this program is its transformation into a National Program, and not just the Navy, ensuring the additional, regular and continued contribution of resources able to cope with the needs of a project of this nature. At the same time where construction of the "Tupi" submarines class, Brazil spent more US$405 million, from 1979 the 1991, in the development of the project of the nuclear submarine. Of this total, US$180 millions had been expenses with the development of the fuel cycle and US$225 millions with the development of the reactor and its components. The SNAC-II (first Brazilian nuclear submarine), must displace between 2,900/3,500 tons submerged, be about 70 meters long, a diameter of at least 8 meters, will possess a PWR reactor of 48 MegaWatts and will be able to sail 28 knots. It will have similar characteristics to the French class Rubis/Amétysthe or the British Trafalgar. As minister of navy under Collor de Mello, who became president in 1990, Mário César Flores, gave the development of nuclear propulsion for Brazil's submarines the highest priority. The Brazilian Navy hoped to finally move forward with this program due its high priority and prestige associated with it. Planning called for a contract design by 2006 and a construction contract by 2009. The first unit of the class will be a conventionally powered variant under the Tikuna SNAC-1 program - in order to test the hull concept prior to installing the nuclear reactors on units two and three. The first nuclear unit of the three-ship class would commission in 2018. In May 2004 a special budget of $7.8 million was released for the completion of a land-based nuclear reactor prototype that will be utilized in the SNAC-2 nuclear-powered submarine program. The reactor, identified as RENAP-11, will be built at the Armar Research Center. The reactor was expected to become operational in 2005. The design will be tested for naval service for the first unit of the SNAC-2 program. Because of the slow rhythm of investments, the Brazilian nuclear submarine could be ready of sea in the 2015-2020 time frame. Until then, it was expected that the sensors and the armament already entirely are nationalized. The project of the hull already was in progress, but the reactor alone would have to be ready in year 2005, a year which came and went. The total of the investments, without including the price of the first submarine will have to cost US$1.2 Billion. The MB has already spent about US$900 million, having still to be expenses more US$120 million for the conclusion of reactors PWR. The cost of each sub nuclear was estimated to be about US$350/400 million dollar, without counting the expense of the development of the SNA. Had the fall of the military budgets, the total of the costs of the project comes being banked exclusively for the budget of the Navy of Brazil, that it invests about US$26 million per year, was estimated that reactor RENAP 50 (in truth 48) MegaWatts, together with the propulsion system (INAP), would be concluded between 2007 and 2011. President Lula, visiting the Aramar Experimental Center July 2007, announced that the necessary resources for the completion of the PNM will be released (R $ 1 billion, distributed for eight years - about $130 million per year). In a meeting in MD, it was established that, in the budget for that Ministry in 2008, the MB should have about $ 130 million, allowing for resume development of the PNM. In the strategic design of the MB, the availability of these resources would add new dimension to our Naval power, ensuring you an enviable ability to deterrence and putting it up to the needs arising from the constitutional mission of the Naval Force. In a 10 July 2007 interview with DefesaNet following the Aramar announcement, President Lula de Silva said "I think that we now have the conditions for completing this project, and Brazil can afford itself the luxury of being one of the few countries in the world to command the technology for enriching uranium and, on the basis of that, I believe that we will be given much more respect as a nation, as the power that we wish to be.... Why not dream big and say that we want to reach the point where a nuclear submarine is a possibility?" Brazil is reportedly working on a new uranium refining technique called *magnetic levitation* that is being developed by the Navy at the Aramar lab in Sao Paulo. The news follows a Brazilian announcement from early 2009 that the country is pursuing uranium enrichment on an industrial scale, with a goal to produce 12 tons of enriched uranium for nuclear power supply. The system of control, entirely national, that is being developed for the RENAP-11 corresponds, in international terms, to the state of the art of the technology of controls. One is about a digital, hierarquizado and distributed system, with high degree of modularização and standardization, with possibility of application in other nuclear, industrial and naval installations, that significant advance in relation to the systems of control currently used in nucleus-electric central offices constitutes. This development has allowed the qualification of the Country in methodology of project and qualification of systems, the hardware and, mainly, software with raised requisite of security, "safe imperfection" and "control of errors". Many of the instruments used in this system have, without a doubt, immediate application in the areas industrial and naval. As in Brazil it did not have tradition of used electric equipment manufacture and the vapor in naval systems of propulsion, the Program had that to contemplate the development, the nationalization and the industrialization of diverse components and equipment of naval job, such as turbine the vapor, electric condensers, bombs, engines and generators. The Laboratory of Equipment Development of Propulsão (LADEP), only of the sort in our continent, that is being constructed in the Experimental Center Aramar, will allow to the accomplishment of tests and the experimental validation of these equipment and others of the sort, that come to be manufactured by our industry. The engine of electronic commutation excited by imãs of rare lands, that is being developed in set with the Polytechnical School of the USP, by means of the Foundation for the Technological Development of Engenharia (FDTE), for the system of propulsion of one Second generation of submarines, also consists in notable technological innovation in terms of electric machines used in propulsion and traction. This type of engine, that combines the simplicity of construction of the multiphase engines with the easiness of control of direct-current engine speed, will have, surely, wide application in electric traction of trains and bus, innumerable metal lamination, machines, tools and other industrial uses where changeable speed is required, providing considerable economy of energy. The development of the archetype of the naval platform accumulates of stocks a fan of areas of similar knowledge with the project, construction, maintenance, repairs and operation of ships that, in this in case that, all takes the philosophy and methodology of the associated work to nuclear the technological and industria research to the sector constituted of the industria of naval construction and navi-parts, of considerable economic importance for the Country. The Laboratory of Naval and Oceanic Hydrodynamics, is being constructed in Aramar, and the Laboratory of Structural Mechanics in Rio De Janeiro, will have to give great experimental contribution to these developments. An extremely excellent aspect in the attainment of the submarine of nuclear propulsion says respect the equipment and not constant systems of the propeller, considered installation as strategical, or either, whose acquisition in the external market can come to be made it difficult by condicionantes politicians and/or those whose dependence of foreign supplier can compromise the aprestamento of the submarine. E enters the systems for which already if it considers previsible serious difficulties for importation or technology transfer if they point out the navigation system inercial(a MB is making tests with gyroscope systems, that they possess 14 wings of control, to be used in missiles and SNA's); consoles of government and depth; acoustic and electromagnetic sonars; systems of communication in low frequency; e the systems of weapons. These developments are the position of the Institute of Research of the Navy (IPqM). The Experimental Center Aramar counts, also, with an advanced Laboratory of Research and Development of Materials; with one equipped workshop of precision mechanics well; with a Laboratory of Analysis of Noises, Shocks and Vibrations; with a Laboratory of Electromagnetic Compatibility; e a Laboratory of Naval and Oceanic Hydrodynamics that will be operated in set with technician and naval engineers of the IPT. Megawatts of power currently meets in construction in the Center of Aramar the installations to shelter 50/48 RENAP-50(reator PWR of), that is included a new building to shelter the future reactor. All the program has a supervision technique and epistemológica of the Technological Center of the Navy in São Paulo (CTMSP), which counts on 600 professionals of superior level and about 1000 of level technician. Located in the University of They are Paulo (USP). The necessity of use of materials with not available technology in the Country has demanded of the Program great emphasis in the development of new materials, for what it has invested strong in the formation and qualification technique of human resources in this area. The planning of a course of Engineering of Materials in Sorocaba and the creation of a School Technique, in the dependences of the Center, for formation of technician of average level in the areas of mechanics of precision and materials, is inserted in this effort and will have to take care of the future necessities of the region. Therefore, this program is much more of that if it has notified, its extension will help Brazil to surpass very of the technological delay in the scientific field. Some considerations fit on the program of Brazilian naval nuclear propulsion, who for financial reasons does not present a more consistent result, despite the advances verified in the development of the fuel cycle and the project of the reactor. Few times if Brazil saw a program considered for that already they had had the chance to know it as important and basic for the National Defense -- so little to be portioned with resources. It is conflicting, and of difficult agreement, to see it restricted to the budgetary resources destined to the Command of the Navy, considering the necessary values for its concretion, if compared with the counterparts of domain of the art of the war and of security for the National Defense. If the qualification of construction of a submarine with nuclear propulsion only represents a victory of the national technology, what not to say of it drags it technological that such activity produces, if not restricting, exclusively, to the military sector. As example of this dualidade they could be cited: the generation of electric energy, the development of new materials, the production of radioisótopos for the medicine and the food irradiation for conservation. It is standed out that, in contrast of that happened in the too much countries (to the exception of U.S.A. and Russia), all the obtained advance did not count on the minimum support of foreign nation. The today existing infrastructure in the country is each more demanding time of the qualification reached for the Navy in the development of the Program of Naval Nuclear Propulsion. This specter is so great that it allows to promote it not as an exclusive necessity of the Naval Force, but yes as national yearning, in same level of other important programs for the social and economic development of Brazil and, more important, for the National Defense. To transform the dream into reality is an option, therefore Brazil will be able to long for one better position in the international scene. Brazil does not have to lose the chance; many sacrifices had been demanded and carried through. It does not have as to disdain it. More early or later we will have of in collating them with new callings of the society and, as well as it occurred in the past (Wars of Consolidation of Independence, you strike in the Imperial Period, participation in the two Great Wars), will not be possible in stealing them to occupy position in the front line. We cannot in apequenar them. The decision to construct or a submarine with nuclear propulsion does not have to be of the Nation; the capacity to know to construct it is an obligation, that we have that to assume with this same Nation, to keep exempts it, defended coesa and for the future generations. The development of new technology of naval propulsion - independence of air, batteries with bigger capacity and durability -, does not have to be justification for not the continuation or deceleration of the Program of Naval Nuclear Propulsion. Brqazil have that to transmit credibility and perseverance in the development of tip technology, senão Brazil will be seen as perpetual nomads deceived with mirages of oases, that never become reality. The country alone will have future if to preserve the conquests of the past and to keep them in the gift. The effort developed for insignes so Brazilian, also in international forums, cannot be olvidado. To materialize the dream to have capacity to construct a submarine with nuclear propulsion will be the solution for the defense of our vast maritime territory. For in such a way it is necessary that, fellow creature to the actions adopted for the governments of the Group of the Four, the Program of Naval Nuclear Propulsion is adopted as a national yearning and is not restricted to the sparing budgetary resources destined to the Command of the Navy, in similar conditions to the adopted ones for the governments of the Group of the Four, when of the development of its programs of nuclear propulsion.